This writer has the privilege of being old enough to have listened to Los Van Van's Songo period and Irakere's styles referred to as Son Bata and Batun Bata as they were happening, and although there is a lot of truly phenomenal Cuban Jazz being made right now, it has been some time since a danceable album has affected him quite the way this one has. 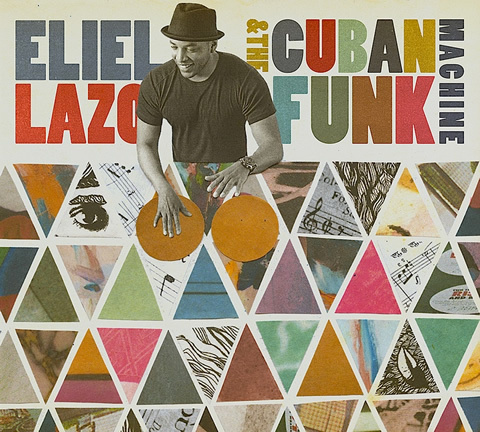 Oh, there is plenty of excellent dance music happening right now too, but there was something different about the 70s, and Eliel Lazo & the Cuban Funk Machine captures it and then runs with it. The leader, Eliel Lazo, is a veteran of Oscar Valdés' group Diákara, and his 2010 recording El Conguero was also excellent but more Jazz oriented. This release is dedicated to Changuito and Juan Formell, and although the only actual Formell cover is a very nice version of A ver que sale, there are elements of Songo in many songs (all of the rest of which are Eliel's own compositions). One key difference between New Songo in this album and the 1970s version of the style is that Mr. Lazo does most of the intricate percussion work on congas, but this works quite well. Other tracks show the raw exuberance that we were hearing in Irakere's dance tracks in the 70s. If you like songs like Irakere's Chekere Son, you can stop reading this review now and go get this album. The best thing about this album is that it is NOT a series of covers. Rather, these originals take the rhythmic forms of the time and continue the process of exploration, adding Jazz and Funk. The percussion is deep, and the guitars, saxophone and trombone keep the melody lines interesting. This should be available at the usual online suspects (iTunes, Amazon), and please do buy it rather than file share. We need to see more of these albums in the future.